Rifabutin is administered orally. Administration of rifabutin with a high-fat meal decreases the rate but not the extent of absorption. Therefore, the drug generally can be given orally without regard to meals. The usual dosage of rifabutin for primary prevention of M. avium complex (MAC) infection in adults and adolescents with advanced HIV infection is 300 mg once daily. Rifabutin in this dosage may be administered alone or concomitantly with the recommended dosage of azithromycin (1200 mg once weekly) for MAC prophylaxis. In patients who have a propensity to develop nausea, vomiting, or other GI upset, rifabutin may be administered with food and the dosage given as 150 mg twice daily. When indicated for the prevention of recurrence of disseminated MAC infection (secondary prophylaxis or maintenance therapy), the Prevention of Opportunistic Infections Working Group of the US Public health Service and the Infectious Diseases Society of America (USPHS/IDSA) states that HIV-infected adults and adolescents can receive rifabutin in a dosage of 300 mg once daily in conjunction with azithromycin (500 mg once daily) or clarithromycin (500 mg twice daily) and ethambutol (15 mg/kg once daily). Steady-state pharmacokinetics of rifabutin are more variable in geriatric patients older than 70 years of age and in symptomatic HIV-infected patients than in younger or healthy individuals. However, the manufacturer makes no specific recommendations for dosage adjustment in such patients. Steady-state pharmacokinetics of the drug during early stages of symptomatic HIV infection reportedly are similar to those in healthy individuals. The manufacturer states that safety and efficacy of rifabutin for MAC prophylaxis in children have not been established; however, rifabutin has been used in a limited number of children (concomitantly with other antimycobacterial agents) for the treatment of MAC infection without unusual adverse effect. Although rifabutin dosages averaging 18. mg/kg (up to 25 mg/kg) or 8.6 mg/kg (up to 18.5 mg/kg) daily have been used for active treatment in infants 1 year of age or children 2-10 years of age, respectively, the manufacturer states that there is no evidence that dosages exceeding 5 mg/kg daily are required for MAC infection. The USPHS/IDSA states that HIV-infected children 6 years of age or older may receive rifabutin in a dosage of 300 mg once daily for primary MAC prophylaxis as an alternative to the regimen of choice (azithromycin or clarithromycin monotherapy). If rifabutin is used in conjunction with clarithromycin (or azithromycin) and ethambutol for secondary MAC prophylaxis in children, the USPHS/IDSA recommends a rifabutin dosage of 5 mg/kg (maximum 300 mg) once daily in conjunction with azithromycin 5 mg/kg (maximum 250 mg) once daily and ethambutol 15 mg/kg (maximum 900 mg) once daily. In the treatment of clinical tuberculosis, rifabutin should not be given alone. The drug is considered a first-line agent for use in multiple-drug regimens in patients with pulmonary tuberculosis who cannot receive rifampin because of intolerance or because they are receiving other drugs (especially antiretroviral agents) that have a clinically important interaction with rifampin. Therapy for tuberculosis should be continued long enough to prevent relapse. The minimum duration of treatment currently recommended for patients with culture-positive pulmonary tuberculosis is 6 months (26 weeks), and recommended regimens consist of an initial intensive phase (2 months) and a continuation phase (usually either 4 or 7 months). However, completion of treatment is determined more accurately by the total number of doses and is not based solely on the duration of therapy. For information on general principles of antituberculosis therapy and recommendations regarding specific multiple-drug regimens and duration of therapy, see the Antituberculosis Agents General Statement 8:16.04. When rifabutin is used in conjunction with other antituberculosis agents for the treatment of tuberculosis, the American Thoracic Society (ATS), US Centers for Disease Control and Prevention (CDC), Infectious Diseases Society of America (IDSA), and others recommend that adults and children 15 years of age or older receive a dosage of 5 mg/kg (up to 300 mg) given once daily or 5 mg/kg (up to 300 mg) given 2 or 3 times weekly. The fact that rifabutin dosage may need to be altered if the drug is used for the treatment of tuberculosis in HIV-infected individuals receiving certain antiretroviral agents (e.g., HIV protease inhibitors, nonnucleoside reverse transcriptase inhibitors) should be considered. (See Drug Interactions: Antiretroviral Agents.) In addition, because of concerns that there may be an increased risk of acquired rifamycin resistance in HIV-infected individuals with CD4+ T-cell counts less than 100/mm3 who receive intermittent rifamycin regimens, the ATS, CDC, and IDSA recommend that rifabutin be administered once daily or 3-times weekly and that rifabutin regimens that involve once- or twice-weekly administration be avoided in these HIV-infected individuals pending further accumulation of data. The CDC also recommends directly observed therapy (DOT) for both the daily and 3-times weekly regimens. The ATS, CDC, and IDSA state that the appropriate dosage of rifabutin for use in conjunction with other antituberculosis agents for the treatment of tuberculosis in children has not been identified. However, the CDC has stated that a rifabutin dosage of 10-20 mg/kg (up to 300 mg) can be given daily or twice weekly in conjunction with other antituberculosis agents for the treatment of tuberculosis in children with HIV infection. If rifabutin is used as monotherapy for the treatment of latent tuberculosis infection in HIV-infected adults and adolescents, the recommended rifabutin dosage is 300 mg once daily for 4 months; some experts recommend that rifabutin monotherapy be continued for 4-6 months in HIV-infected individuals. 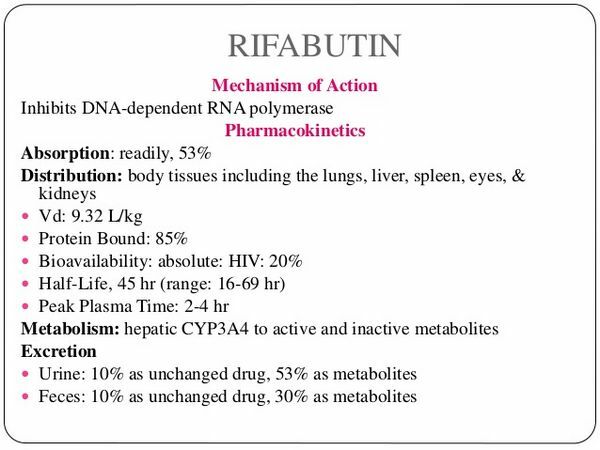 When rifabutin is used in conjunction with pyrazinamide for the treatment of latent tuberculosis infection in HIV-infected adults and adolescents, the usual dosage of rifabutin is 300 mg once daily for 2-3 months. Rifabutin concentrations reportedly are decreased in patients with impaired renal function as a result of decreased distribution and more rapid elimination of the drug. However, the clinical importance, if any, of this finding has not been determined, and the manufacturer currently makes no specific recommendations for modification of dosage in such patients.